SUMMARY: While great strides have been made in the reduction of 30-day all-cause hospital readmissions, CMS still penalized more than 2,200 hospitals in 2013 for exceeding 30-day readmission rates for heart failure, pneumonia and myocardial infarction. In 2015, CMS penalties will extend to acute COPD and elective hip and knee replacements. 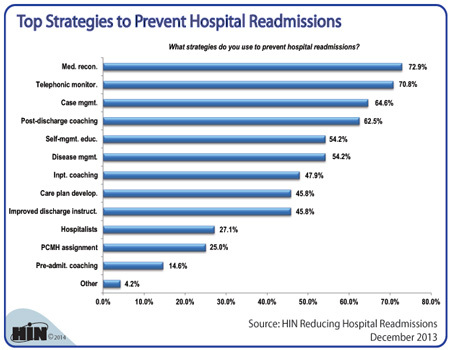 We wanted to see what strategies healthcare companies use to prevent hospital readmissions. 2014 Healthcare Benchmarks: Reducing Hospital Readmissions is available from the Healthcare Intelligence Network for $149 by visiting our Online Bookstore or by calling toll-free (888) 446-3530.